You place chips by using the left mouse button and you remove them by using the right mouse button. The Re-bet places a bet equivalent to the previously made bet. There are two different bets to place in Pai Gow Poker. The ante bet (forced) is placed in the left $ field and the optional Fortune Bet is placed in the right $ field. Maximum and minimum bet amounts are displayed in the upper left info field. To make more funds available for play please click on the cashier ($) icon. You cash out simply by leaving the game (X). All your winnings will then be automatically added to you account. All winnings are automatically added to your stack minus a 5% commission. Once you’re satisfied with your bet click “deal”. This will bring up a close-up view of your seven cards. You either click on the two cards you want to become your two card low hand or press “hint” (F5) for suggestion of how to arrange them. Using the “hint” feature will arrange your hand based on the same rules than govern the automatic arrangement of the dealer’s cards. To play the Fortune Bet place a chip in the right $ field on the layout. The Fortune Bet pays out separately from the ante bet and requires a five-card straight and up in order to pay. The Fortune Bet is based on the full 7 card hand is not affected by how you choose to arrange your cards. As soon as all the players at the tables have placed their bets, the dealer will deal seven cards to each player, including himself. Your task is to arrange these seven cards into two separate hands. The high hand (5 cards) and the low hand (2 cards). Based on the Pai Gow Poker hand rankings, you must arrange them in a way that will beat both the two corresponding dealer hands. The high hand must ALWAYS be a better ranked hand than the low hand. There is also an option to let the game automatically arrange your hands based on some basic principles. 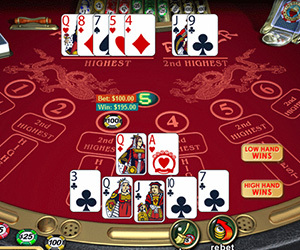 These are the same principles used to arrange the dealer’s hand. The deck used to play Pai Gow Poker is a standard 52 card deck with the addition of a joker. The joker can only be used to complete a straight, a flush or straight flush. Otherwise it is treated like an ace. Once you have finished arranging your hands, the dealer flips his cards. These are the rankings whereupon your hands and the dealer’s hands are measured. Whoever has the better ranked high and low hand wins that particular part of the total Pai Gow Poker hand. A five card straight of the same suit. Three cards of the same value combined with a pair. Five cards connected by value, i.e. 2-6. A hand consisting of two separate pairs. Note: Unlike normal poker hand rankings, the ace to five straight/straight flush is considered to be the second best one only beaten by the ace to ten straight/straight flush. The best possible low hand in Pai Gow Poker is a pair of aces followed by pairs of lesser value. Often, however, one does not have a low hand pair. Then the highest card counts. If both you and the dealer hold a low hand ace, the highest valued second card in the low hands will decide the winner. So a low hand of ace, jack beats a low hand of ace, ten and a king, six low hand beats a jack, ten hand.